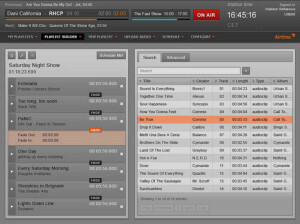 This simple tutorial is going to introduce you an Ubuntu radio automation software Airtime. It is a free and open source radio management application for remote broadcast automation, and program exchange between radio stations. Airtime has been intended to provide a solution for a wide range of broadcast projects, from community to public and commercial stations. The scalability of Airtime allows implementation in a number of scenarios, ranging from an unmanned broadcast unit accessed remotely through the Internet, to a local network of machines accessing a central Airtime storage system. Airtime supports the playout of lossy compressed audio files in both MP3 and AAC formats and the open, royalty-free equivalent Ogg Vorbis. It also supports playout of lossless FLAC and WAV format audio files. Then you’ll be able to install Airtime from Ubuntu Software Center or Synaptic Package Manager. Does this software support switching of audio sources to include satellite programming? I just get “-bash: airtime-easy-setup.deb: command not found” evn though it is downloaded. I need help please ! I have downloaded AIRTIME and installed it over and over. I copy some terminal commands but it goes nowhere. What am I doing wrong ? The install does not work.